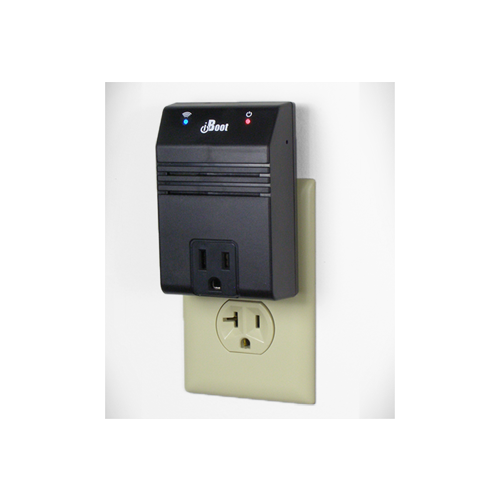 The iBoot WIFI web power switch is designed to be used for home and business applications. 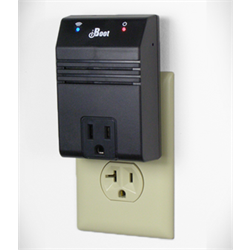 It communicates via a WIFI connection and provides remote power control and rebooting via power cycling from anywhere on the local LAN or over an Internet connection. iBootWIFI lets the operator manually control power, check status and remotely power cycle equipment such as routers, computers, servers, digital signage, kiosks or datacenter equipment from anywhere using a simple web interface. iBoot can pay for itself quickly by eliminating travel to remote sites or server rooms and helping to prevent down time. The AutoPing feature can be set to regularly 'Ping' a computer or network device and automatically cycle power if the Ping goes unanswered. The new iBoot cloud service eliminates the worry of tracking WAN IP's or setting up port forwarding and allows deployment in environments where inbound port forwarding isn't allowed. The cloud service also makes it easy to manage multiple iBoot units from one central location. Unlike many competing devices even at a higher cost, reliability and safety are of utmost importance so iBoot products are UL listed for USA and Canada.